This cute idea is always a howling success with students! It can be used as a welcome to school treat on the first day of school or as a favor for Open House Night. 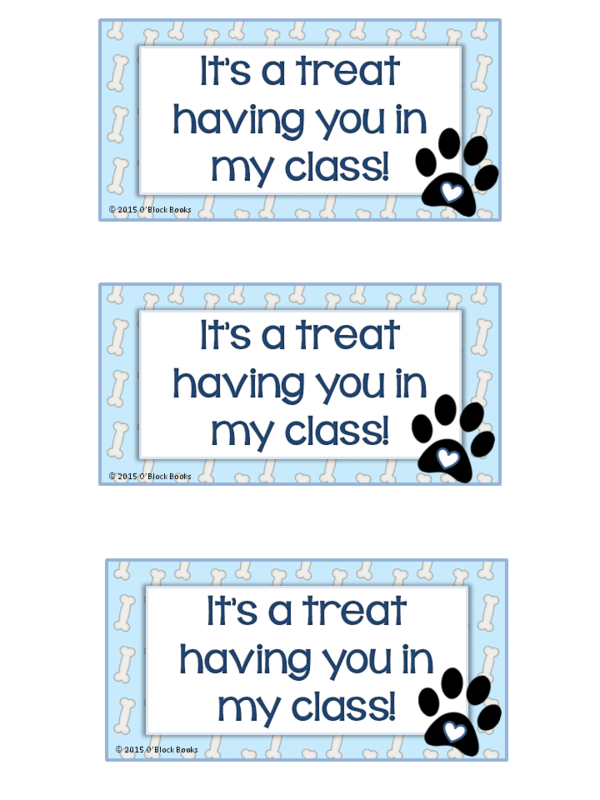 Print the free treat bag tags (right click on the tags and choose Print). Cut them out. Fill a sandwich bag for each student with a handful of Scooby Doo graham cracker sticks (they are shaped like dog bones). Tie each bag shut with ribbon and attach a “It’s a treat having you in my class” tag. Use them as a reward or treat on the first day of school or place them in a large dog bowl or basket at Open House Night. They are a great way to get off on the right paw this school year with students and/or parents! These treat bags are the perfect compliment to these dog-themed first day of school awards available in our Dog-Themed Back to School Pack. This pack makes back to school not as “ruff”.